As earth-friendly gardeners, we’re always looking to refine our techniques in ways that benefit the garden and wildlife. One area in which we’ve made changes is how we handle garden cleanup. While we used to cut down as much as possible in fall, now we leave most perennials standing in the landscape through the winter to provide cover and food for birds and other wildlife. And just as we’ve changed the routine of our fall cleanup, we’ve adjusted the way we do the spring garden cleanup, too. In Indiana, early spring is mud season. But digging in wet soil can damage the underlying soil structure. So put off any transplanting until the soil has dried. To test soil, take a handful of soil and squeeze it into a ball. If it crumbles when you gently poke it, the soil is dry enough to plant. If it sits there in a little lump, it’s still too wet. When the garden is especially wet, put off any garden chores, including cutting down and raking. Even walking around in mucky soil can compact the beds you’ve worked so hard to improve. While it’s tempting to take advantage of the first warm days in March to thoroughly cut down and rake out the garden, hold off if you can. Our native bees and other insects are still hibernating, some in hollow stems and others in bare bits of ground. If you haul all those grasses and perennial foliage to the compost heap now, you’ll be removing an entire generation of beneficial insects! If you just can’t bear to look at brown stems anymore, cut down spent growth to the fresh green leaves at the bottom (or to the ground in the case of plants that haven’t yet put out new leaves). Leave the debris in small piles in an out-of-the-way spot in the garden. Insects will emerge as the weather warms, and then you can pitch those little brush piles into the compost. We find that the easiest way to cut down grasses is to tie them into a bunch with twine, then cut through their base with a pair of shears. Especially if you are cutting grasses early in the season, the twine lets you set the entire bundle in an inconspicuous location until insects emerge and birds have taken what they want. Mulch acts as an insulating layer on top of soil. 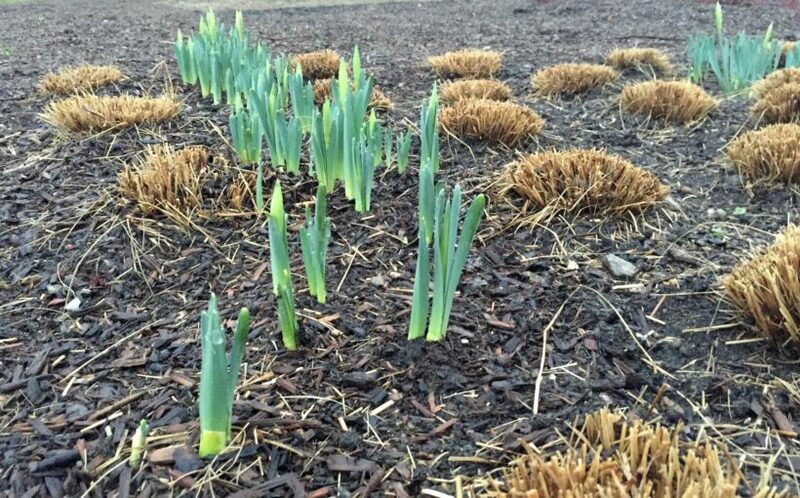 If you put a blanket of mulch on top of cold soil, you’ll trap that cold and in turn delay plants from emerging. Mulch applied in early spring is also likely to lose its color quickly. Instead, we prefer to build soil in April by adding compost where necessary, but we wait until the soil has thoroughly warmed in May before putting down mulch. If you laid a thick blanket of mulch on the beds in fall, be sure to rake it off. It’s fine to leave a light layer of mulch, but removing most of the heavy layer of winter mulch lets the soil warm more quickly. Chipped leaves you used for winter mulch can go straight to the compost pile. When you do apply mulch, try to leave a section of the garden soil bare. Even a very small spot can be a boon to ground-dwelling insects. If you have wrapped your containers (as we do) in insulating bubble wrap and burlap, you can remove those layers. Wait until you’re pretty sure that we’re past hard freeze (that is, the temps aren’t likely to drop below 32 degrees). We lost a pot to cracking one year by removing the wrapping too early. Once you’re sure freezing temperatures are in the past, you can bring out containers and statuary you stored over the winter, as well as stored birdbaths and garden furniture. Spring garden cleanup doesn’t have to be done all at once. Slowing your spring cleanup and timing it to the weather is a terrific way to experience your garden intimately—and to ease into using gardening muscles you haven’t exercised all winter!